The cliff erosion between Barton-on-Sea and Milford cliffs means that the coast path is now a permissive path. The line of right of way has fallen into the sea with a route now being open only thanks to landowners allowing the path to be unofficially moved back. 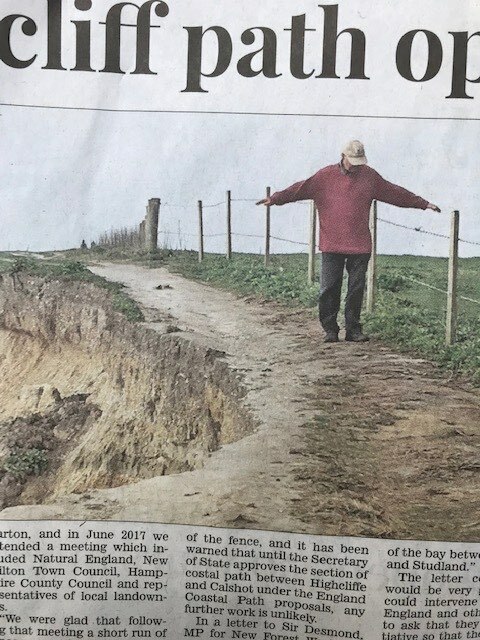 Now Milford-on-Sea Parish Council has expressed fears that, with increasing erosion, the coast path could close. It appears that any action by New Forest District Council, Hampshire County Council or Natural England is unlikely until the Secretary of State for Environment has approved plans for the continuous England Coast Path. This scheme will allow for path roll-back where there is erosion. New Forest MP Sir Desmond Swayne has said that he is making representations to Natural England. Meanwhile it continues to be just possible to pass along the coast. If you walk east along the Bournemouth Coast Path and keep going you get to Brittany. This is because the BCP is part of the E9 which links at Dover with France leading down to Spain and Portugal. Or you can go further east along the Belgium and German coast. The latest news is that the Emerald Coast section in Brittany is opening after a 37 year dispute. Whether the BCP ceases to be part of the E9 after the end of this month is uncertain. Walkers should note that the annual November closure of the Sandbanks ferry service has lasted much longer than is usual. A resumption of the service cannot now be expected until shortly before Christmas. 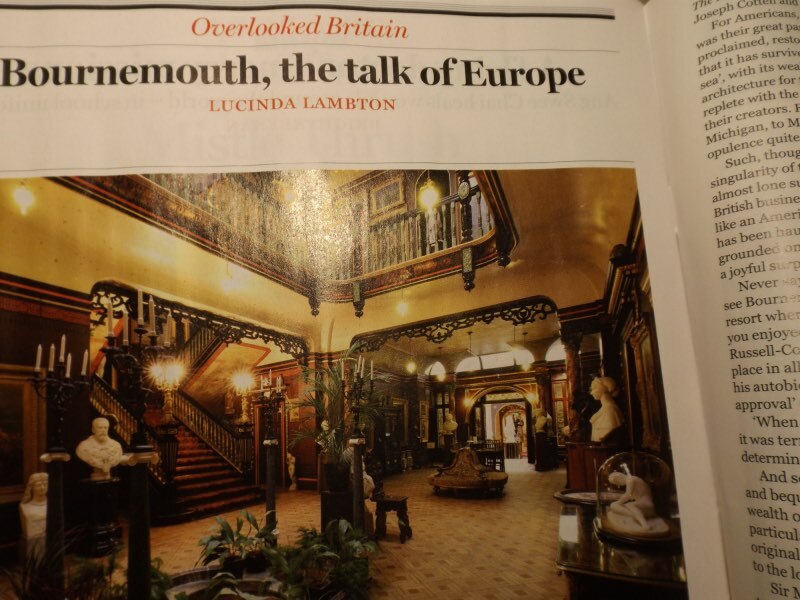 Lucinda Lambton has been on Bournemouth’s East Cliff to visit the Russell-CÃ´tes Art Gallery & Museum. Her account appears in the January’s issue of The Oldie which is arriving in shops now. The feature on the Russell-CÃ´tes Museum is part of the Forgotten Britain series. As author of Temples of Convenience, a history of the lavatory, the architectural writer will surely have been impressed by the house’s famous tiled ladies’ convenience. But it’s the view which is even more breathtaking with the bay often compared to the Bay of Naples. Black Friday starts earlier and lasts longer in the UK than USA! 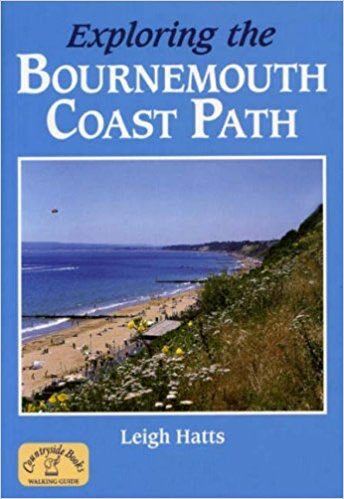 But the good news is that Exploring the Bournemouth Coast Path guide can be obtained Â for just Â£5.99 – a saving of Â£2. The publisher’s offer on the Countryside Books website is valid until Christmas. On Armistice Day a century ago today Highcliffe had lost 36 men in the Great War. In 1918 Highcliffe Castle was home to Gordon Selfridge of Oxford Street store fame. The locals had seen the recreation ground occupied by the Mrs Gordon Selfridge Convalescent Camp for American Soldiers. This conflict was despite Britain’s years of dialogue with the Kaiser which included three harmonious weeks for the German monarch at Highcliffe Castle in 1907. War was thenÂ Â unimaginable. The first hint of war came to Highcliffe on Sunday night 28 June 1914 when the First Secretary at the Austrian Embassy was dining with Colonel Edward Stuart Wortley. A telegram was brought into the dining room and handed to the diplomat. He passed it to his wife before turning to his hostess Violet Stuart Wortley and giving her the news that Archduke Franz Ferdinand had been shot dead at Sarajevo. Violet’s inner reaction was disappointment because it was likely that the following week’s ball at the Austrian embassy in Belgrave Square would be cancelled. But very soon it dawned on everybody that the news might be worse than causing a change in the social calendar. There was a growing realisation over the next few weeks that the German Emperor Wilhelm, a former guest of Edward and Violet at Highcliffe, was a real threat to Britain and its Empire. War was declared a month later on August Bank Holiday Monday. A week later Austria was also an enemy and the diplomat was sent home. The Emperor, or Kaiser Wilhelm, was Queen Victoria’s first grandchild. His mother was Princess Victoria who in 1888 became Empress. But she was only the Kaiserin for 99 days due to the sudden death of her husband Frederick III. Young Wilhelm became Kaiser at just 28 years old and soon distanced himself from his progressive mother who took inspiration from her father Prince Albert and disassociated herself from anti-semitism. As the widow retired to paint so her son pursued his own eccentric and illiberal policies. As early as 1862 Wilhelm had been present in Highland dress at the wedding of his uncle the Prince of Wales, the future Edward VII. However, family ties did little to keep the countries together. In 1891 Queen Victoria welcomed her grandson on a state visit to Britain but the Kaiser still sent a telegram of support to South Africa during the Boer War. The Queen’s death in January 1901 brought a chance of progress. Wilhelm came to Osborne House on the Isle of Wight to be at her bedside. Wilhelm and Edward were both with the Queen when she died. The Kaiser was suporting her as she looked at her son and heir. One of Edward’s first acts as King whilst still at Osborne was to make the Kaiser a Field Marshall. The German Crown Prince became a Knight of the Garter. The same year Britainâ€™s Foreign Secretary Lord Lansdowne attempted a new approach to Germany but this failed. Wilhelm would not trust his uncle Edward. The link with Britain was further weakened in August when Wilhelm’s mother died. In 1902 the Kaiser was at Sandringham for the King’s 65th birthday and in 1904 Edward made a visit to Berlin. But the big bid for keeping Germany happy was attempted in 1907 when Edward successfully pressed his ministers to agree to the Kaiser being invited to make another State Visit. On Monday 11 November, a date for ever to be most associated with the First World War, the Kaiser arrived by sea at Portsmouth where he took a special train to Windsor. The Kaiser suddenly had the idea that he might stay on in England for two weeks and raised the matter with his uncle. Edward thought of Highcliffe Castle which he knew well and where he had spent a summer weekend in 1904 with its tenants Mr and Mrs Cavendish-Bentinck. The King was a friend of the owner Colonel Edward Stuart Wortley who only the previous year had welcomed to lunch the young King of Spain. He had reported back favourably to his British fiancÃ©e Princess Ena, Edwardâ€™s niece. The request which could not be refused came at a difficult time. Stuart Wortley had again let the castle and was living nearby. The tenant, who kept parrots and monkeys, was quickly moved to another property whilst the Colonel personally went to Bournemouth to buy bidets for installation in all bathrooms. Highcliffe had another memory for Edward as it was there that he had enjoyed an early motor car drive. In 1898 Lord Montagu brought over from nearby Beaulieu his new open top Daimlar and, with the Edward at the wheel, the two men had reached 40mph on New Forest roads. Now Edward had granted a royal warrant to Coventry-based Daimler who were producing all British cars having dropped German engines. A fleet was put at the disposal of the Kaiser for trips around the countryside. Future pioneer aviator William McArdle, Bournemouth’s Daimler agent known as ‘Motor Mac’, was in attendance. Catering arrangements were placed in the hands of the King’s friend the ‘Duchess of Duke Street’ Rosa Lewis who brought food daily from The Cavendish in Jermyn Street to Hinton Admiral Station. This was a round journey of two hundred miles. Admired flower arrangements on the dinner table were provided by gardener Fred Purton. A post office, complete with a specially created ‘HIGHCLIFFE CASTLE’ postmark handstamp, was set up in the cellar under the supervision of Christchurch postmistress Miss Mary Fuller. Postman Steve Martin walked daily from the town carrying the Kaiser’s personal mail. Violet’s niece Nancy Mitford later suggested that Highcliffe, where she had spent some of the happiest times of her life, seemed to be “the world’s hub”. The State Visit ended on Monday 18 November when the Kaiserin returned to Germany whilst her husband Wilheim took a special train to Hinton Admiral Station. King Edward was always horrified at the size of his nephew’s retinue and the house party was so large that accommodation was sought beyond the village. Even the Colonel and Violet had to sleep in another building. The immediate entourage included the ambassador Count Metternich and Admiral Von Muller. The Kaiser started each day with a cold bath of sea water brought up from the beach. Mornings were usually spent in Violet’s sitting room where he worked on papers and telephoned Berlin. Stuart Wortley devised a programme of country house visits for the afternoons. Wilhelm visited Kingston Lacey, where his uncle Edward had been a guest in 1905 and planted a cedar tree. Wilhelm also planted a tree there after being received by the recently widowed Henrietta Bankes. Another tree was planted at Hurn Court, home of the Earl of Malmesbury at Throop, during one of two visits. At Romsey Abbey the Kaiser corrected the vicar on an historical date. He went shooting with Lord Alington at Crichel in Dorset. But not all went smoothly despite Motor Mac being in the front seat with a map. Returning from seeing Lord Wimborne at Canford Magna, the Kaiserâ€™s Daimler stalled in the Millhams Lane ford. Two farm labourers had to push the car out of the stream and bump start it before the procession passed below Kinson Church. The car was seen taking the Kaiser through Bournemouth’s Lower Pleasure Gardens. Some of his vast staff were staying at the nearby Royal Bath Hotel and one evening the band of the German Royal Yacht played at the Winter Gardens. It was in the pine-scented town that Wilhelm’s estranged mother had hoped to spend the last months of her life until prevented by her strict German doctor. On Wednesday morning 28 November the Kaiser and Colonel Stuart Wortley walked along the Highcliffe Castle drive to plant an oak. After Wilhelm had placed six spades of soil around the sapling he asked the Colonelâ€™s two young children to finished the job. (The spot is now covered by the houses of Rothesay Drive.) Afterwards the Kaiser got into the waiting Daimler to be driven to Wilton House in Wiltshire. On Friday the Kaiser, in spats and carrying a walking stick, took a walk along the cliff top with Prince Max Egon zu Furstenberg. In the afternoon he visited Christchurch Priory where he had worshipped the previous Sunday. The next day, St Andrew’s Day, there was a children’s tea party at the village schoolroom where the Kaiser cut a six foot cake. On Advent Sunday Wilhelm attended matins at St Mark’s Church in Highcliffe. After lunch came the most significant moment of the entire visit although none recognised it at the time. Wilhelm invited his host Edward to join him in the library. They sat in a window recess in the ante room looking out to the west. The trigger for the conversation which followed my have been a request received that very morning from the well-known journalist William Stead for an interview. It had came, in hope of success, by way of a friend of Stuart Wortley to the ambassador who simply relayed the request to the Kaiser. His Majesty had met the journalist, who was to perish on the Titanic, and was not impressed so he refused. But he still wished to convey a better image of himself to the British people. Unburdening himself to his aimable host was tempting. Violet later recalled that the Kaiser seemed to enjoy the informality of English country life. “I felt that his spirits were like those of a schoolboy released from school.” But three years earlier Violet been told by Baron von Stumm, a relative of the German Embassy’s first secretary, that the Kaiser was “the greatest blunderer in Europe”. He was to be proved right as Wilhelm, in the cosy library, embarked on a long rambling discourse on how he felt about Britain and its unfair attitude to him among other matters. That night Stuart Wortley made a made a record of all he could remember from the Kaiser’s monologue. The contented Kaiser stayed an extra week so on the following Friday 7 December there was a further conversation as the two men walked a mile to a lodge near Mudeford and back. On the way the Kaiser claimed that he had built his naval fleet to support Britain against Japan. Again Stuart Wortley made a note of the conversation. During the stay the Kaiser received a printed collection of his speeches which included the quote: “I do not want to be a so-called Constitutional Monarch, who reigns but does not govern.” This claim was about to be challenged as a result of his conversations. After visiting the Kaiser in Germany during September the following year, Stuart Wortley arranged with the monarch’s agreement for the gist of their conversations to be made available to the press. Stuart Wortley chose to approach The Daily Telegraph where the proprietor Harry Lawson recognised a potential political sensation. At once a reporter was sent to meet Stuart Wortley who read aloud all his recollections as they were taken down in shorthand. Leading Telegraph writer John Benjamin Firth then turned the words into ‘an interview’ which ran to ten typed pages with room for corrections. Publication of this scoop was delayed until the manuscript had been sent to Berlin for approval. “No newspaper has had a more important contribution,” said Lawson when the text had been safely returned with Royal endorsement. But when this so-called interview, with an unnamed ‘British gentleman’, was eventually published in The Daily Telegraph on Wednesday 28 October 1908 any goodwill between Britain and Germany was lost. The English did not care for being described as being “mad, mad, mad as March hares” for not believing that the Kaiser and Germany were their friends. Retired diplomats were accused of being the so-called interviewer as Stuart Wortley remained silent. The Kaiser also suggested that the British had defeated the Boers thanks to his advice secretly given without telling France and Russia. Not only were the British alienated but so also were the French and Russians. The Japanese were unhappy to learn that the German naval build-up was aimed at them. Edward VII was forced to conclude that the lavish State Visit had failed. “Of all the political gaffes which HIM has made this is the greatest,” he observed. But the reaction was far stronger in Berlin. The Germans were outraged that their monarch had been having a private conversation with an Englishman about them and in addition had exposed their country as a laughing stock. Wilhelm was condemned for his autocratic rule during a two day debate in the Reichstag. His family was unhappy and dismayed as was the military. There were strong calls for, and even private attempts at, engineering an abdication. The Kaiser appeared at first unaware of the furore and then expressed surprised. He was away from the capital having a prolonged stay with the ill-fated Archduke Franz Ferdinand before going hunting in the Black Forest. He later admitted that the handling of the affair “brought boundless shame and disgrace on the House of Hohenzollern and unspeakable suffering and sorrow on myself and the Kaiserin”. He was so chastened that at one point he intended to give his Chancellor von Bulow “the renunciation of personal intervention by the ruler in the machinery of government”. He granted Bulow a two hour audience but afterwards slipped into depression and appeared to suffer a breakdown. His doctor prescribed fir-needle baths. The trees would have been a familiar sight to him in Bournemouth. How did ministers allow such a gaffe laden interview to be published? Bulow was in Berlin on the day of the conversation in the Highcliffe Castle library. The day before he had made a long speech and during that week secured a vote of confidence from the Reichstag. 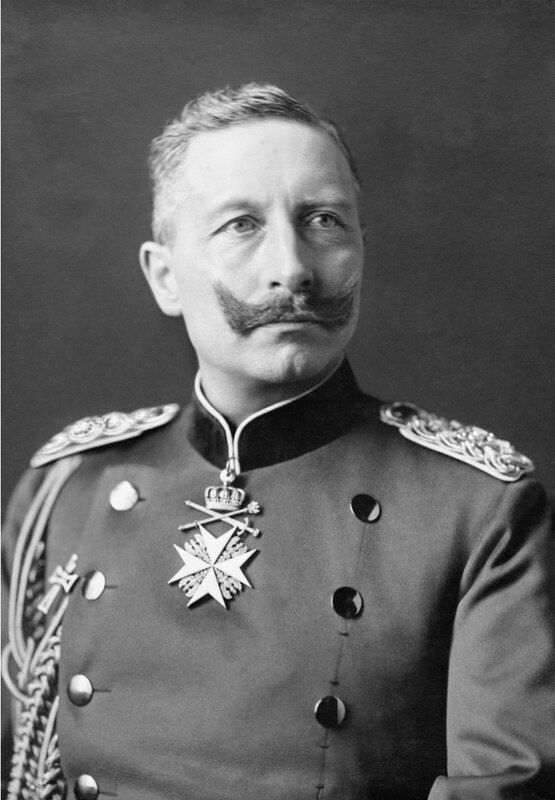 It has been suggested that the Chancellor did see the Telegraph’s text but hoped that it would make the Kaiser look foolish and so weaken his power. However, Bulow always denied having read the ‘interview’ and later described it as a “tactless stupidity”. He claimed to have asked the foreign ministry to check the text. It is more likely is that Bulow did not have the courage to stand up to the Kaiser. As a result of this fiasco both suffered. Power slipped from the Kaiser and Bulow resigned the following year. That catastrophe came just six years later on the night of Tuesday 4 August when Britain was forced to enter what was to become the First World War. 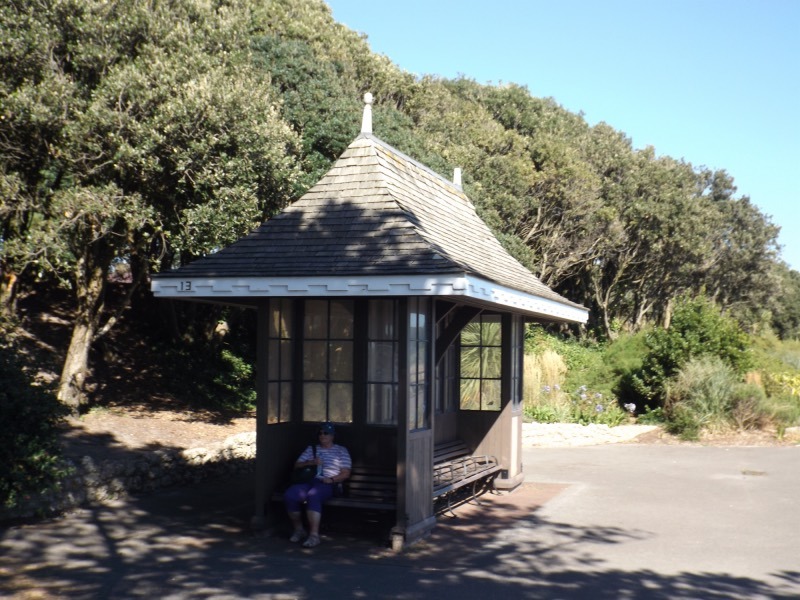 At Highcliffe the following day Violet stood at the bottom of the Highcliffe Castle garden watching the British Fleet passing along the horizon. Everyone in Highcliffe who had met the Kaiser in 1907 was amazed and horrified. The stained glass window at the Castle given by the Emperor and featuring the German eagle was damaged and soon removed. The postman returned his Fourth Order of The Crown German medal. At Kingston Lacey, where the Kaiser had planted a tree, Henrietta Bankes quickly packed away the bust of the Kaiser which had arrived from the German Embassy a month after the Royal visit. At the time she had been enchanted by Wilhelm. Highcliffe Castle is open dailyÂ 10.30am-5pm; admission Â£3.50. The grounds are open free until 6.30pm and the teaÂ rooms until 4.30pm. Note that the zig-zag, part of the coast path, is closed until Easter. 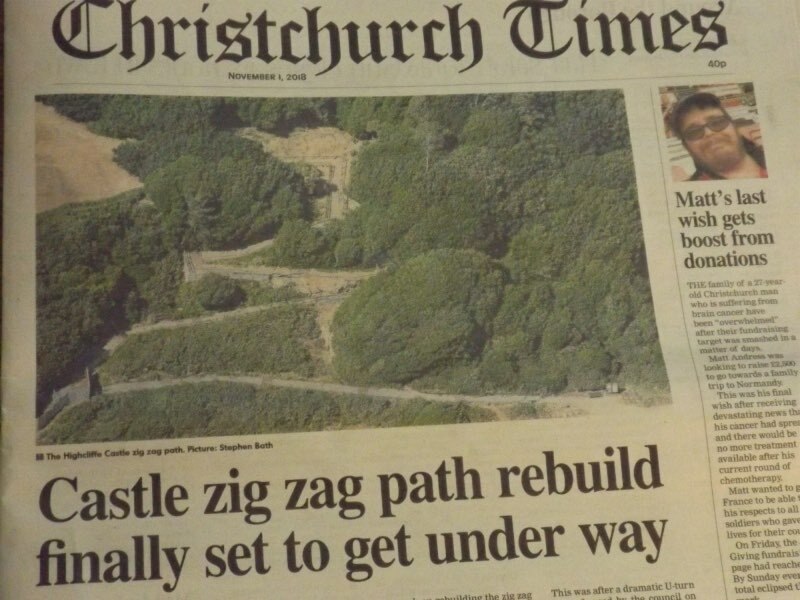 Work on the Highciffe Castle zig zag path is due too start next Monday. The path, a vital link on the coast path, is has been closed for some time. The work should be completed in time for an opening at the start of Easter weekend Thursday 18 April. Temporary DiversionÂ Walkers going east on the Christchurch Coastal Path should leave the castle grounds by the front gate and turn right at the main road. Follow the 180 year old castle wall to pass the lodges. Go right into Wharncliffe Road and after the road has turned left go right along a footpath leading to the cliff top. “It’s been along wait,” said the bookseller as he laid the Hampshire: South volume of Buildings of England on the counter. It has. The last edition was fifty years ago. Since the new book, a Pevsner Architectural Guide, Â retains the old county boundaries it is possible to enjoy a survey of the coast from Bournemouth to Lymington and beyond. Includecd are new buildings such as the Hilton in Bournemouth. St Stephen’s is highlighted as the town’s “finest church”. 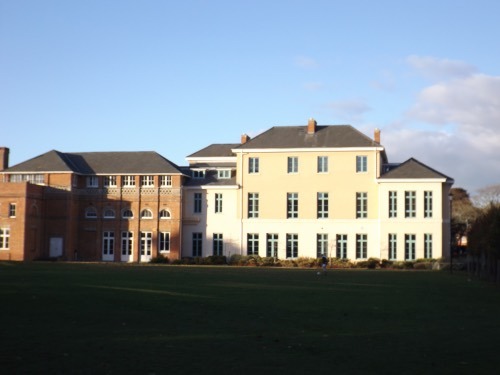 In the Pier Approach area there is little praise for the Bournemouth International Centre but it’s good to see mention of John Keble’s house surviving next to the Hermitage Hotel. An important reminder is naming the pier’s theatre architect Elizabeth Scott who had already won the competition to design the Shakespeare Memorial Theatre at Stratford. The Royal Bath Hotel on the coast path has a 1837 original core by Pugin’s friend Benjamin Ferrey. To the west the Alum Chine suspension bridge is described as “a big surprise”. To the east at Boscombe the star is San Remo Towers described as “Transatlantic…turns Spanish-Californian” and “one of the most elaborate seaside flat blocks Â of the 1930s’. Also getting a mention is the 2003 The Point on Sea Road hill which replaced The Pier Hotel where Aubrey Beardsley lodged. But still surviving is Shelley Manor which the joint authors reveal dates from the late 18th century. Hengistbury Head has a half page entry which recalls that it was nearly spoilt by Gordon Selfridge who had plans f0r a castle. He was living at another castle a little further along coast Â – Highcliffe which has fascinating additions from medieval France. There is no mention of Barton-on-Sea. I know some of it has fallen into the sea over the years but there is Â Tudor cottage. 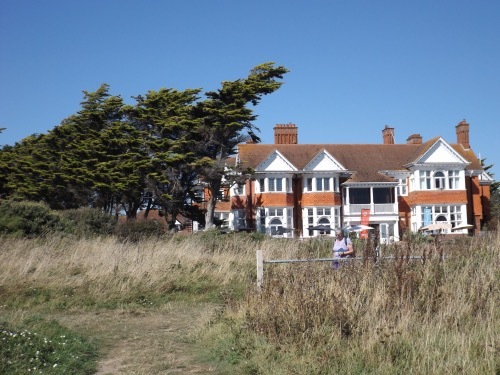 There are also coastguard cottages and elsewhere there is careful mention and dating of coastguard cottages in Bournemouth (1865 next to Highcliff Hotel) and in Southbourne. Beyond here the detail for Milford-on-Sea is of course impressive. The editors are probably right to deplore the change of name for Westover built for Alexander Siemens. But as The Beach House pub we can now easily drop in to enjoy the Pre-Raphaelite glass and William De Morgan tiles. 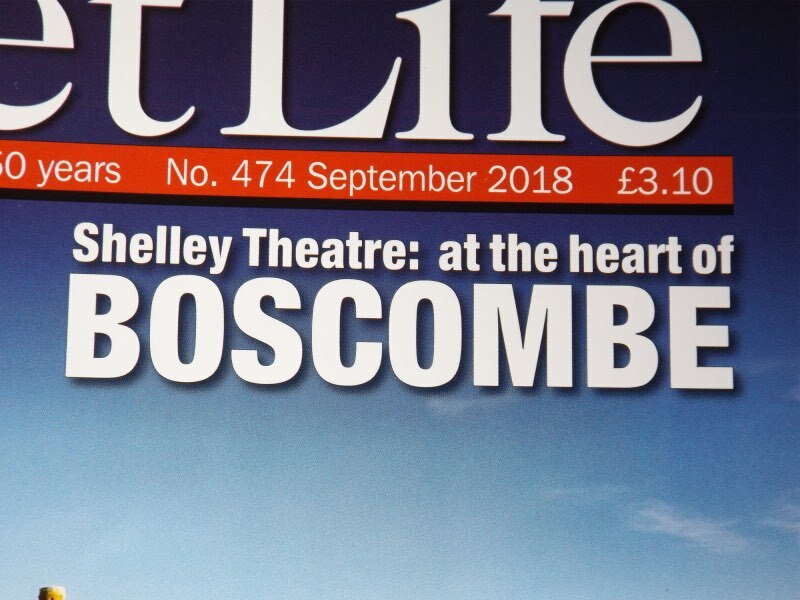 The September issue of Dorset Life has a feature on the Shelley Theatre at Shelley Park. 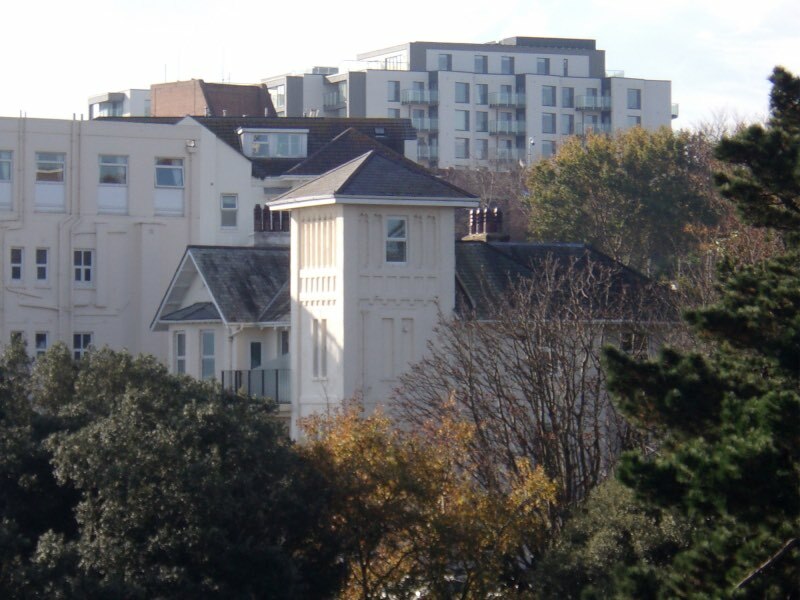 Shelley Park at Boscombe is the clifftop house bought by Percy B Shelley’s son for his Â famous mother Mary. She died just before she could move from her London house but Sir Percy and his wife Jane enlarged the seaside ‘cottage’ and made it their own home. The poetâ€™s heart, snatched from cremation on Viareggio beach, was kept in the north-east upstairs room along with the now Bodleian Shelley Collection. The extensive grounds stretched to the cliff and Lady Shelley had a summer house at Shelley Chine. This now has the name (and strange spelling) of Honeycombe Chine. The Shelleys were keen on theatre,Â and built their own attached to the main house. They painted scenery, wrote plays and appeared in productions. One of the stage drops depicted Case Magni. Now the house its a medical centre whilst the Shelley TheatreÂ has a programme of stage and cinema events. There is also a slowly expanding cafe. Charlotte Gordon of Boston University, author of Romantic Outlaws, visited in 2016. The closure of the ramp at the end of the cliff top path above Avon Beach means that walkers should stay on the promenade between Mudeford and Steamer Point. The Daily Echo has the full story.